The latest kerfuffle over two-year degrees tells us a lot about the current condition of debate about higher education in the United Kingdom. As Mike Ratcliffe has demonstrated, the long-foreshadowed consultation announced last week proposes a small-scale fix to a niche in the higher education market. At the most ambitious end of the government’s projections, only about 5% of students will be studying on these degrees by 2028. But that’s not how it has felt. Proponents have seized another opportunity to represent British universities as dozy and dated, while academics have reacted with panic. I’m not sure this helps. It all starts with money, because that has become the baseline in much higher education discourse. 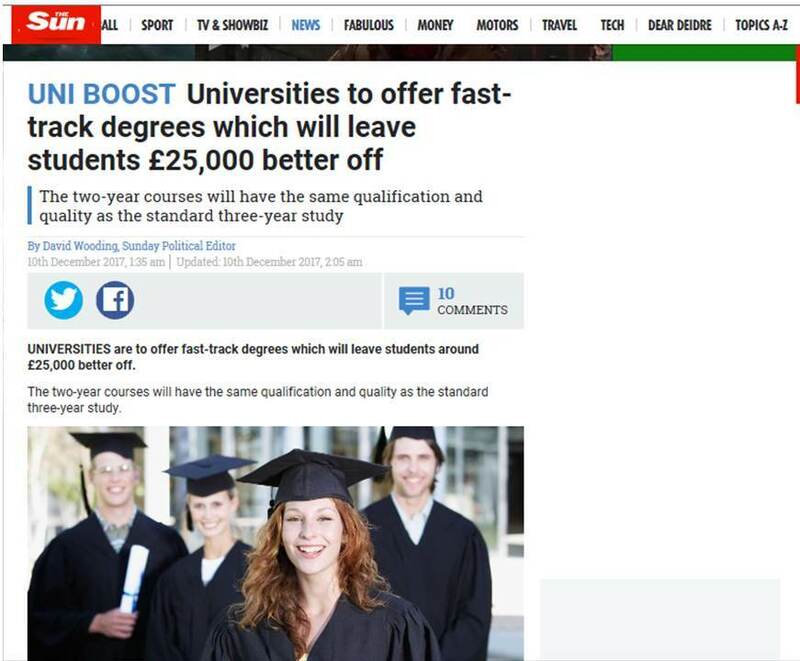 The headline in The Sun seized the point: ‘Universities to offer fast-track degrees which will leave students £25,000 better off’. The Telegraph followed suit, stating that ‘Students will save up to £25,000 under radical plans’. Jo Johnson tweeted links to both these pieces, but he knows this is a speculative figure. As the Department for Education announcement states: ‘The proposals … include a £5,500 (20 per cent) saving for students in total tuition costs compared to a standard three-year course. When added to the average salary of £19,000 in the first year after graduating, it means a potential £25,000 benefit overall.’ So let’s be clear: this is arguably a potential ‘benefit’, but it simply is not by any means a £25,000 ‘saving’ on the cost of a degree. These reports have also fudged the question of demand. The consultation document states only that: ‘About three quarters of the providers who responded to our 2016 Call for Evidence reported seeing a demand for accelerated courses from students or employers.’ As market research, that wouldn’t convince me to invest. There’s very little evidence in practice that students are drawn towards cut-price options, while the three-year model retains unquestionable status and recognition. I’d also be wary about trusting that data on employers’ attitudes. In some areas, granted, there may be immediate skills shortages; but in truth there are not many of these. Moreover, most employers tend to want evidence of work experience, internships, ‘international experience’, and so forth. What’s the point of cramming a degree into two years if the three-year students, who have collected these badges along the way, take the pick of the jobs? And by the end of the week: enter Simon Jenkins. Yes, universities are a ‘cultural confidence trick’, and of course fees are ‘astronomical’ and vice-chancellors’ salaries are ‘indefensible’. It’s easy to fill a column with this stuff after the achievements of Adonis and his acolytes over the summer. I expect you could get a Russian bot to produce it. I imagine it also pulls in the readers, partly because academics can’t bring themselves to ignore it. But it’s desperately damaging, and also massively misleading. Ben Rosamond exposed one of Jenkins’s statistics as worthless. 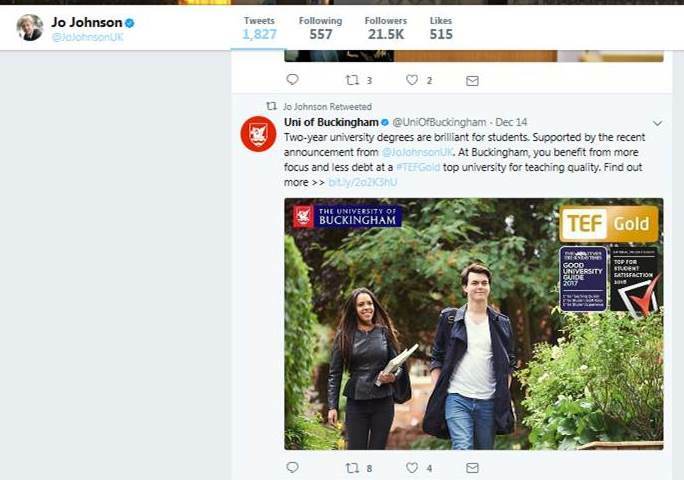 Further, Johnson categorically did not say, as Jenkins claims, that the ‘three-year university course … is absurd and should end’. Once in awhile one might hope for a minister capable of calling out such lies and idiocy rather than just retweeting his fan-club and – yes, really – advertisements for private providers. But maybe academics don’t help themselves with their reactions to such provocation. The UCU’s response to two-year degrees (from last February) is a model of over-reaction, stating that accelerated degrees risk sacrificing the UK’s ‘global reputation for excellence’. And one doesn’t have to look far on social media to find assertions that two-year degrees will be inferior, or even impossible to deliver. This is difficult to sustain. There is no logical reason why an additional 120 credits worth of modules could not be delivered over two summers. Granted, this would manifestly alter the nature of the academic year, and would most likely (although not necessarily) reduce research time for academics. It might therefore accelerate not only degrees, but also the differentiation between research-heavy and research-light universities. But this ship has sailed. We have had the Higher Education and Research Act, which trashed the traditional idea of the university, while across the country many universities are not only struggling to attract students but are also earning precious little research income. The leaders of such universities are understandably desperate for new ideas. In this context, two-year degrees start to look less like a cause of trouble than a symptom of more profound changes. I also wonder whether there is just a whiff of snobbery in this backlash. The three-year degree, with its built-in time for reflection and suite of development opportunities, is a gold-standard model for 18-year-olds. But what about the mature students who have been draining from the student-pool? A 30-year-old, with plenty of work experience but in need of a career boost, might have little interest in the trappings of the university experience. Such a person might quite reasonably want a degree from a local university, and want it fast. Ratcliffe notes the way the two-year announcement was scheduled for release on a Sunday. In recent months this has become HE-bashing day, and academics across the country wait by their twitter feeds, steeled for the latest assault. That’s me as well, of course; however, I wonder whether occasionally our headlong rush into polarisation might only exacerbate the damage.